I am not an expert by any means, but it might be those darn walnut trees. Apparently the only things 100% tolerant to massive amounts of juglone (the toxin from the walnut tree root system) are some vine-related veggies (beans, melons, squash). Even with raised gardens, as I tried for lettuce and radish, the tree canopy runoff from rain will affect the plant growth. Worse yet, I found that squirrels have decided my raised bed is a good spot for walnut burying – which also adds toxin to the soil. Who knew one tree species could be so evil? Thanks for the comment, Andrew. I guess the key is to find a walnut-free spot! It may be the walnuts, or it may be that you are garden amateurs… like us in Ottawa. 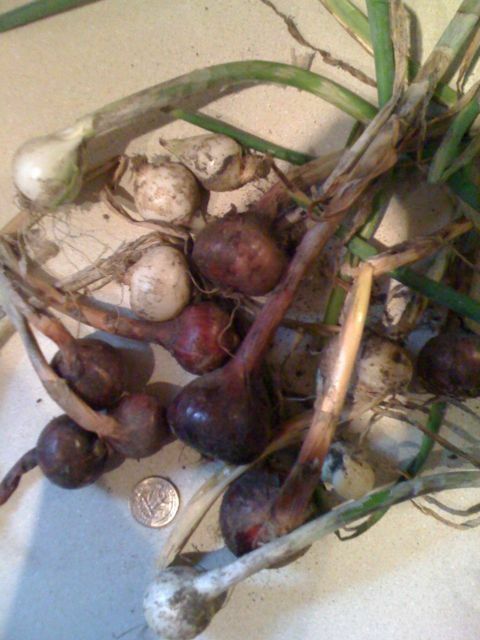 We planted onion bulbs this past summer and I am fairly certain they were the same size at harvest as they were when they were planted. There is certainly some secret that has alluded both of our farming groups. Perhaps the “Seed to Table” book will have the answer?